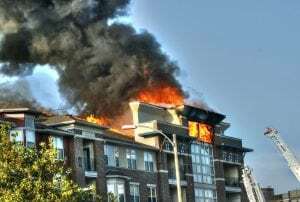 Ronkonkoma, NY (March 17, 2019) – Police say that, early Sunday, a woman involved in an apartment fire was forced to drop her baby from the second floor of the building. The fire happened at the Colony Park Apartments on Peconic Street around 1:00 a.m., according to authorities. When police and firefighters arrived at the scene, the complex was completely engulfed in flames. A mother was forced to drop her infant child from the second-floor balcony into a bystander’s arms before she jumped from the building herself. The mother and the child both received injuries and were taken to the hospital, but they are expected to be okay. A man who was also in the apartment complex at the time was taken to the hospital with injuries as well. Five units were destroyed by the fire, which remains under investigation at this time. We would like to take a moment to extend our sympathies to those who have been injured in this fire, and also thank the brave firefighters who fought this fire and put their lives on the line. Many fires that take place across New York cause serious injuries and can even quickly turn into a fatal incident. In the midst of a New York fire event, you have many protections from harm. There is nothing more overwhelming than having to watch a fire take place and receiving injuries from an event that you believe could have been prevented. Our accident attorneys at Hach & Rose are experienced in these matters and completely dedicated to your case and help you receive the results you deserve as you seek compensation in the midst of your case. We will listen to you during this difficult time. Please contact us for more information at 212-779-0057.